Unions are hoping that Missourians’ decision to reject right-to-work takes some steam out of the nationwide right-wing campaign to expand them. Labor groups won a landmark victory Tuesday as Missourians voted by referendum to overturn the state’s new right-to-work law, an embarrassing rejection for the state’s Republican lawmakers. Proposition A asked voters whether or not they would like to enact the right-to-work statute that the state legislature passed and former Gov. Eric Greitens (R) signed early last year. The “no” votes defeated the “yes,” according to returns released Tuesday night by the secretary of state. The ballot measure drew interest far beyond Missouri due to the rapid spread of right-to-work laws around the country. Such laws give workers who are covered by a union contract the option to not pay any union fees while still enjoying the contract’s protections. Unions are likely to lose members and funding after a state becomes right-to-work. [post_ads]The Republicans who control both chambers of the legislature thought they made Missouri the 28th right-to-work state last year. But labor groups and their allies succeeded in rounding up enough signatures to put the question directly to voters, then spent months building a “no” campaign to drive voter turnout. The result was a rare victory for unions in the nationwide right-to-work fight. Although the laws used to be confined mostly to the South and West, the anti-union groups that back them have succeeded in making them the norm rather than the exception around the country. Even longtime labor strongholds like Michigan and Wisconsin have passed right-to-work measures in recent years, thanks to GOP control of state government. Unions are hoping that Missourians’ decision to reject right-to-work takes some steam out of the nationwide right-wing campaign to expand them. In the runup to the vote, they argued that the referendum would prove that the lawmakers rushing to enact them were out of touch with voters on the issue. “We think that the legislature and the people are miles apart on this,” Erin Schrimpf, a spokeswoman for the labor-backed coalition We Are Missouri, told HuffPost the night before the vote. The “no” campaign outspent “yes” groups by an eight-to-one margin ahead of the vote, according to an analysis by the Missouri Times. Labor groups also fanned out with their door-knocking operations, trying to reach not only union members but the general public with their argument that a right-to-work law would drive down wages and working conditions for everyone. One campaigner, Chloe Collins, told HuffPost Monday that she was canvassing six days a week because she feared the law would weaken her union and therefore her job benefits and protections. Collins works at St. Louis Lambert International Airport as a janitor and is a member of the Service Employees International Union Local 1. ″I feel I wouldn’t have security at work,” Collins said. The union membership rate in the U.S. is near an all-time low, with just 6.5 percent of private-sector workers belong to a union. The lawmakers pushing right-to-work laws have argued that the statutes would attract new employers who don’t want to deal with collective bargaining. They also claim the statutes would free workers from having to support unions they may disagree with, but workers are already free from having to pay for their union’s political activity. The right-to-work law means they wouldn’t have to pay for bargaining and representation, either. While Tuesday’s vote may provide a boost to the labor movement, referendums have their limits as a strategy to beat back right-to-work laws. Only about half of states allow for referendums, and the Missouri referendum only worked because labor groups moved quickly for a ballot measure after the right-to-work law was passed. 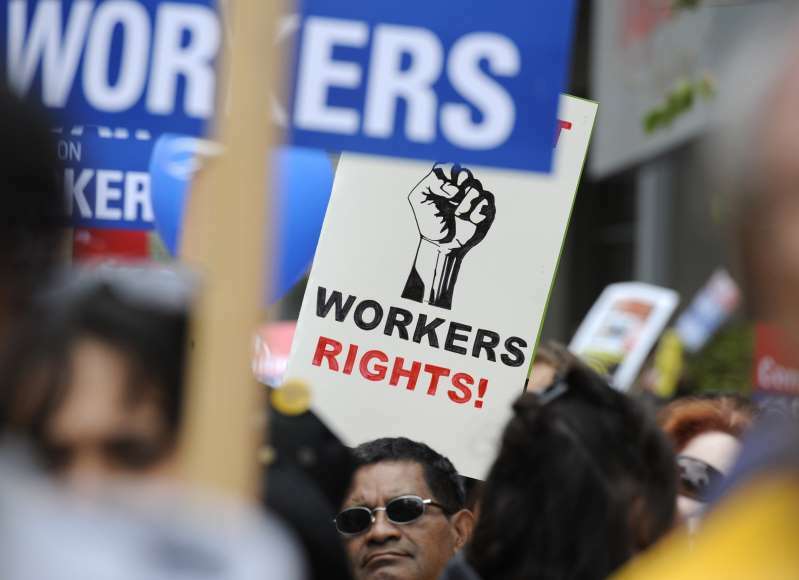 In other states, right-to-work statutes have been on the books for years or even decades. Voters in these states may be less likely to overturn what they see as long-settled law.